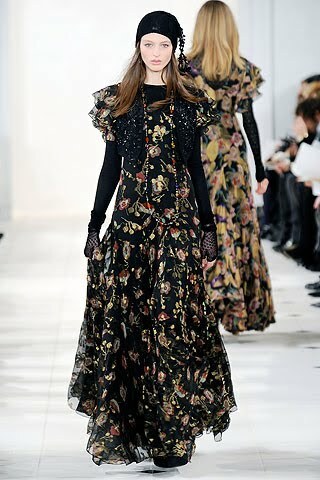 Yet more gorgeous long gowns, tailored coats and loose silhouettes. 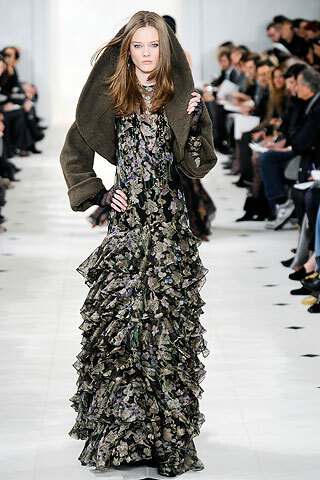 Ralph Lauren's classy collection this season featured plenty of floral prints, and more intriguingly, maxi dresses layered over long sleeve tops. I'm really not a fan of layering strappy maxi dresses, but the generous ruffled sleeves and lace detailing give these looks a new dimension. Is this something you'd try out? as-salam aleykum! thanx for photos! I've already seen this beautiful collection by ralph, and these gypsy elements almost killed me))) I like the vivid combination of gentle shiffon materials with tweed, it's gorgeous! and of course second pic is the best! I wouldnt wear anything under the dress. the one i really liked is the first one on the right. Most reasonable i think. I can't see myself wearing the long sleeves with the dress (picture 4) but picture 2 looks great. The contrast between the summery, floaty fabric of the dress and the thick jacket is interesting. I think they're uber-feminine. #3 and #4 are my favourites - love the lace top under the dress. Inspirational indeed!